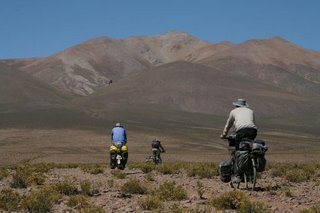 Stage 3, Part 5 covers our traverse of the great altiplano of Bolivia, down-time in some of the world´s highest cities, and a gathering of friends for the most remote section of the trip to date--the Sur Lipez desert that connects the south of Bolivia to northern Chile. At the end of this stage, Brooks completed his Ribbon Of Road journey and returned home to San Francisco when we reached Salta City, the capital of Northern Argentina. Pictures from this stage are online in the Gallery section of this Web site. In La Paz, we teamed up with Jamon, the Frenchman. We enjoyed each other´s company during the last stage and decided to continue together across the smooth-sealed surface of the Bolivian Alti-Plano from La Paz to Uyuni. 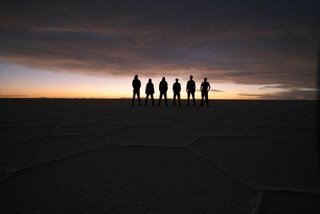 From there, we would make preparations for a 3-day crossing of the Salar de Uyuni, the largest salt pan in the world and then push on 11-days through the Sur Lipez desert, a lonely and forgotten corner of the frontier between Bolivia and Chile. Unfortunately, Jamon recieved terrible news just hours before our planned departure from La Paz. His mother had passed away and he needed to return to Paris immediately to be with his family. Brooks and I took some extra time in La Paz to assist Jamon before hitting the road again. Leaving La Paz, we climbed for hours out of the smog-filled bowl surrounding the city center and pushed for 150 miles south across the 13,000 foot Pan American Highway to Oruro. 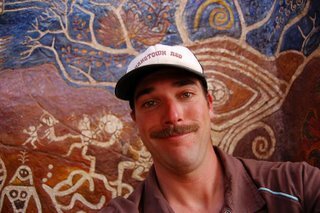 In Oruro, Jamon contacted us from France, he had decided return to Bolivia to cross the Salar and Sur Lipez with us but needed a few days to hop a bird back to La Paz and then bus south to rejoin forces in Uyuni town. We were both ecstatic as Jamon had become a close friend and, at 6´4¨, was also a great drafting partner. Just a few hours later, we ran into Daveed Numero Dos in the town's plaza (Gregg cycled through the Peruvian Andes with Daveed Numero Dos a few months before). He was interested in the Sur Lipez crossing as well. We needed to kill a few days to allow for Jamon´s return so the 3 of us created a side-trip to Potosi, the world´s highest city at 13,780 feet. Potosi is famous for it´s silver mine--it´s purportedly so big that that the Spanish could have built a bridge to Madrid from La Paz with it´s plunder. 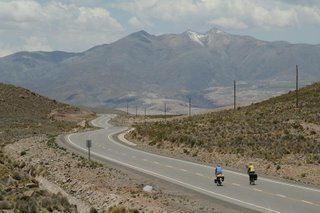 The road to Potosi was brand new and ¨like hot butta on your breakfast toast¨-- a dream to ride. It has a team of paid ¨Bicyle Street Sweepers¨ who pedaled up and down the highway in matching neon yellow outfits, with brooms in hand, to maintain the spotless surface. 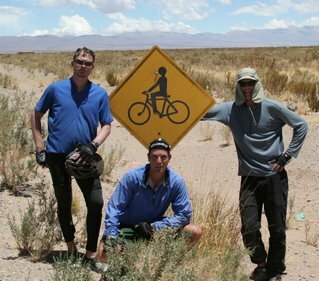 Like most of the poor countries we´ve traveled through on this trip (Bolivia is actually the poorest country in South America), the local people can´t afford cars and only a handfull passed us in 3 days of pedaling. After watching Bolivia´s newly elected president, ¨EVO¨, parade himself around the Potosi plaza a few hundred times for the city's anniversary party, we spent two days fattening up on quinoa soup and mystery meat entrees before hitting the dirt back road to meet Jamon in Uyuni. This kicked off an extremely arduous stretch of the trip, 14-days of travel on rough dirt tracks with little or no services. 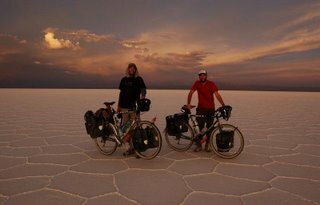 After three days of riding through bleak desert, we arrived in Uyuni. Word of our planned expedition to the Sur Lipez travelled fast and several of our old cycling cronies had emailed with news of their plans to join us. In Uyuni we celebrated the regathering of our 6-rider fellowship in grand style over an arsenal of odorous cheese and wine that Jamon had brought from France -- Crsytal arrived on a bus from Chile (she had to return home just a few days later), Jamon on a plane directly from Paris, Don Thomas from Peru after a grueling rip of consective 100+ mile days, and the three of us from Potosi. The Salar de Uyuni and Sur Lipez desert crossings are not to be taken lightly. The section includes several 16,000 foot passes and an average elevation of over 13,000 feet, nighttime temperatures often fall to minus 20 degrees and heavy winds and sandstorms are common during the day. There are also no decent maps available for the area and water or food supply stops are few and far between. Our posse took every precaution and spent two days buying supplies, plotting GPS points, and hiring off-road jeeps to place food and water drops along certain points of the route. The Salar de Uyuni was a much anticipated section of the trip for us and it fully lived up to our expectations. 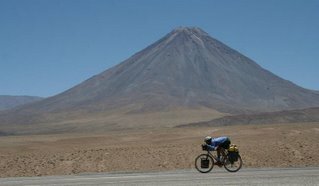 We pedaled for 3 days across it´s 4085 square mile bulk. The UV radiation was so harsh from the reflection of the cyrstalized salt surface that Gregg's skin burnt completely though a long-sleeve wool top and trekking pants. It even fried his tongue, front teeth and the inside lining of his nose. The rest of the crew sported similar burns and some interesting burn lines. We camped in the shadow of a huge volcano and on an island of cactus shaped like a fish. The sunsets were some of the best on the trip and we collectively snapped over 1,000 photos during our time on the lake. After the Salar we bee-lined directly south for the Sur Lipez. For the first few hundred miles we selected a maze of criss-crossing dirt tracks that used to serve as mining roads to various small villages that are now quasi ghost towns. In Juloca, the drunks in the plaza summoned the owners of the only store in the village. We promptly vacated its dusty shelves of canned tuna, rice and 10 year old RC Cola. After our spending spree of $6 US, the store owner conferenced with her daughter, aunt, and sister. They called us back inside and asked if we would be willing to buy their store for $12 US. We all chuckled at first and then quickly bit our tongues in shame as we realized that they were very serious about this offer. In Spanish, ¨No Hay¨, means ¨there is not¨ or ¨nothing¨. In the Sur Lipez, we learned the true meaning of ¨No Hay¨ and jokingly named our team ¨The No Hay Five¨ and the land we were traveling through, "The No Hay Territories". The land was barren, empty, beautiful, and a departure from any other place in the world we´ve experienced. Within the group, leverage became extremely important. Peanut butter, pasta, mayo, and tuna fish were huge bartering items in our game of leverage. Don Thomas never quite understood the importance of leverage and continually hammered every bit of food he could get his hands on. He hit rock bottom one day, making a pathetic lunge at Gregg's snicker bar coming up with nothing but air. Every last drop of water in a can of tuna was slurped down as if it were an orange flavored sports drink. We experienced days where we pushed for hours through deep sand only to find that we had taken a wrong turn. There were sections without any roads. There were strong headwinds and rim-cracking washboard. Some of the worst riding conditions one could ever imagine, left us wondering who's idea it was in the first place? Nonetheless, at the end of the day, we were all in it together and all of us were having an amazing adventure within our adventure. By the time our group arrived to San Pedro de Atacama, Chile, we had discovered something tangible in the land of no hay--a level of companionship and camaraderie that will simply never be replicated. In contrast to southern Bolivia, Chile had everything--road signs, food, water and beer. We promptly celebrated our successful crossing of the Sur Lipez with a beer drinking and binge eating extravaganza we deemed the ¨facial hair olympiad¨. The rules were simple, drink, eat, tell tall tales from the desert, and trim your beard in the most embarrasing and most offending format possible. Brook was awarded the trophy with his combo of Magnum PI moustache and gas passing that cleared out the entire retaurant. Our group split up in San Pedro as Jamon flew back to France and Daveed Numero Dos back to Texas. Then we (Brooks, Don Thomas and Gregg) scaled the 15,500 foot Paso de Jamas to the Angentine border. Our decent into Argentina brought us a new trip land-speed record. With a 6,000 ft drop in elevation over just a few kilometers and a strong tailwind, we blasted our way to 62 mph, easily besting our prior record by 10 mph. We can comfortably predict that we'll never again approach that speed on a bicycle. Just after passing the Angentine border, we reunited with Daveed Numero Uno with whom we cycled through the bulk of central Mexico with. It had been nearly 8-months since the last time we pedaled with him and it was great to catch up with each other´s experiences. We road through the Atacama Desert, amazing canyon country, and then dropped into the tropical vegetation of Purmamarca after a breat-taking downhill through some dense fog. From there, we continued to descend into Salta, the center of northern Argentina. The sight, sounds and smell of life were very welcomed after such a long stretch through the desert. The Stage ended over several bottles of Don David, Northern Argentina´s best Malbec, and huge fillets at La Lenita, Salta´s tastiest steakhouse. From there, Brooks took a bus to Santiago de Chile where he flew back home to be with his family for the holidays.